First Citizens Bank believes in investing in our community. Today, they are investing in Hardin County Schools Early College and Career Center through Central Kentucky Community Foundation. First Citizens Bank is investing not only money, but also time and talent in this new educational experience. Our community continues to develop and Central Kentucky Community Foundation offers people and businesses opportunities to invest in that advancement. Please contact Central Kentucky Community Foundation if you are interested in giving to the Hardin County Schools Early College and Career Center Fund. 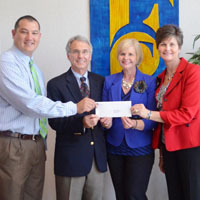 Pictured above are: Dan Robbins, Early College and Career Center Principal; Al Rider, Central Kentucky Community Foundation President/CEO; Marilyn Ford, First Citizens Bank President/ COO; and Nannette Johnston, Hardin County Schools Superintendent.